Need some ideas for some Halloween-themed snacks? Check out what I made recently for a Halloween party I attended. 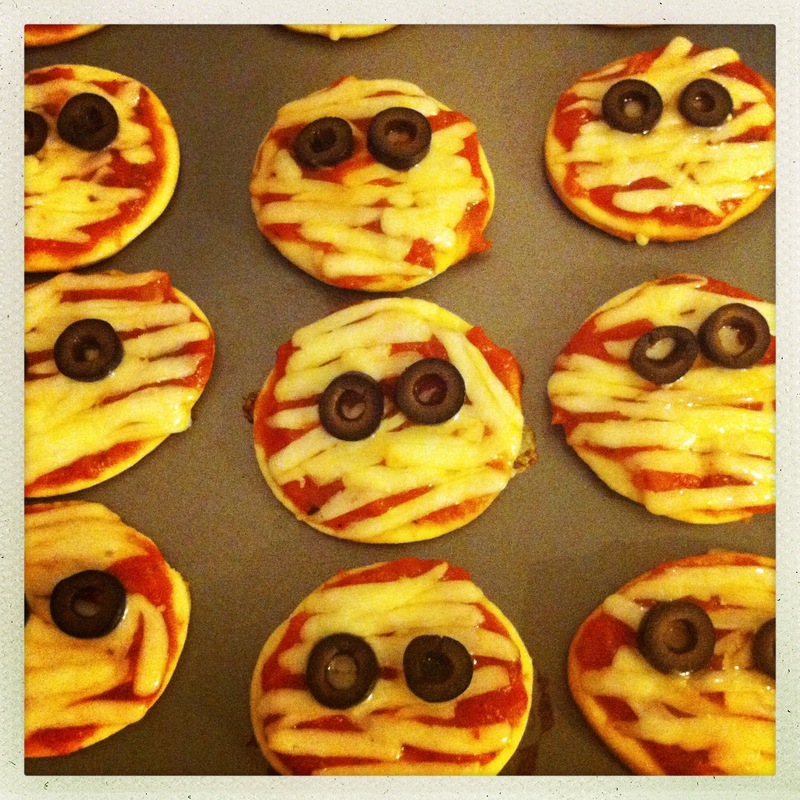 These mini pizzas, that look like mummies (the cute bandage wrapped kind), are delicious and adorable. You use shredded cheese to mimic the bandages and two sliced black olives to make the eyes on the face. They are really easy to make and turned out pretty well once I figured out a good cooking time and sequence of baking. Last year when I made them, I baked the pizza crust at the same time as the toppings, causing the pizzas to look more like Freddy Krueger than a mummy. This time I baked the pizza crust first then applied the toppings baking the pizzas for a few minutes, just enough to slightly melt the cheese and warm up the pizza. Any dough recipe will work for this. You can also buy ready-made pizza dough. For my mummy pizzas, I used the recipe on the back of the yeast packet I bought. Gradually add enough remaining flour to make a soft dough. The dough should form a ball and will be slightly sticky. Roll out the pizza dough to whatever thickness you want your pizza crust to be. This crust recipe makes a 12-inch pizza. I like my crust thin so I rolled out the dough a little larger than that. Any remaining dough can be rolled out again to cut more mini pizza crusts. Place the mini crusts on a greased baking sheet and place them on the bottom rack of the oven. Cook the pizza dough about 10-15 minutes until crust is slightly brown on the bottom. Once the crusts are baked, remove from the oven a let cool. Take a teaspoon of pizza or tomato sauce and spread it over each mini pizza crust (you can add more or less sauce if you want). Grab some of the shredded cheese and lay it across the pizza crust to resemble bandages. I lay them horizontally across the crust. Place 2 sliced olives in the middle of the mini pizza for eyes. Bake for about another 5 minutes to warm up the pizza and slightly melt the cheese. 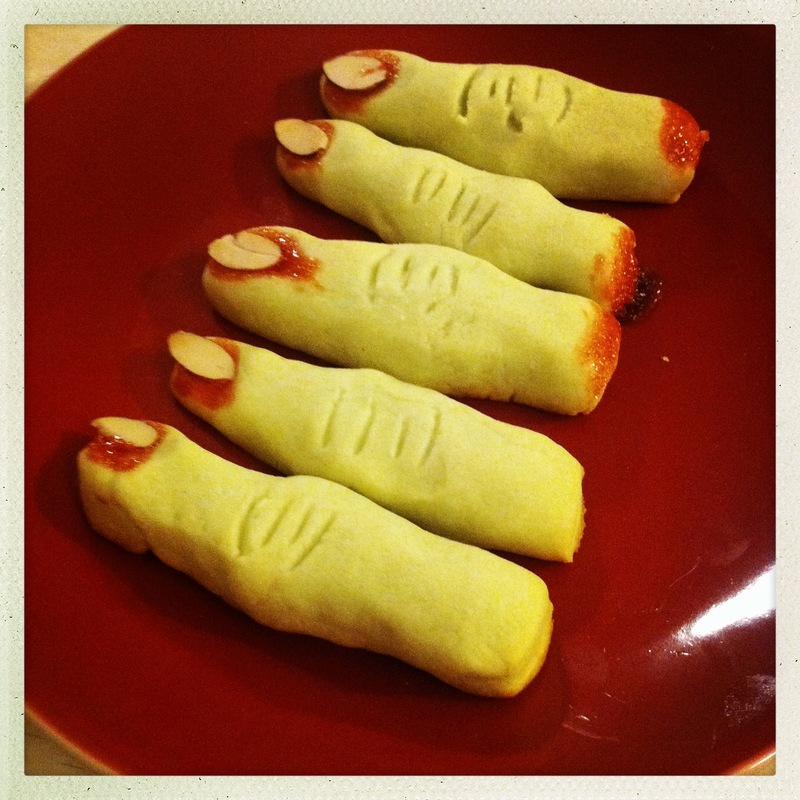 The recipes call these Halloween finger cookies, severed finger cookies or witches finger cookies. But in honor of the upcoming zombie apocalypse and the start of a new season of The Walking Dead, the bloody severed fingers I made belong to zombies. The cookies are really easy to make and lots of fun to shape. And don’t worry about not being able to form a finger shape-the more gnarled and bumpy looking, the better. 4 tablespoons red-colored jam or jelly (any fruit flavor). Combine the flour and baking powder, set aside. Cream the sugar and butter. Add the egg and extracts and mix. Gradually add the flour mixture and beat just until combined, scraping down the bowl, especially the bottom. Since these fingers belong to zombies, I added a couple of drops of green food coloring (3-4 drops) to give it a slight green color, à la rotting flesh. But you can leave out the green food coloring if you want. The dough will be crumbly, so knead it together with your hands and roll it into a ball. Wrap the dough in plastic, and chill until firm, 20 to 30 minutes. Once the dough is chilled take it out of the fridge. On a lightly floured surface, roll out the dough into finger shapes, about 2-3 inches long. Pinch the dough in two places to form knuckles. Make semi-circles or lines with the tip of a sharp knife for the knuckle. It’s time to make the fingers bloody. With your thumb slightly flatten the end of one of the fingers. This is where the fingernail will go. Cut the other end with a knife to give it a severed, cut finger edge. Add a few drops of water to the jam or jelly and stir so that it becomes a little runny. Add a couple of drops of red food coloring. Dribble some jam to the cut end of the finger where it was severed. Spoon a little jam to the depression made at the other end. Place a sliced almond here for the fingernail. Press down on the almond gently so the jam oozes out to either side to resemble a bloody fingernail. Place the cookies on a lightly greased cookie sheet. Place the entire baking sheet in the freezer for about 5 minutes (this helps the cookies keep their shape during baking). Remove and bake in a preheated oven for 10-12 minutes or until the edges are just barely starting to turn golden. Allow to cool for a few minutes on the baking sheet before removing. Happy Halloween (and happy eating)! Previous Post Hunting for good pan con lechón in L.A.